Beautiful 1 Ounce 2018 Britannia Gold Coins produced by the British Royal Mint. Each coin features Queen Elizabeth II on the front. The coin's face value of £100 is also located on the front. The reverse of the coin features lady liberty carrying a trident and shield. 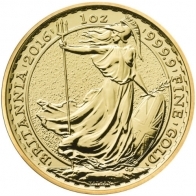 Circling the coin is written "Britannia, 2018 1 Oz 999.9 Fine Gold". 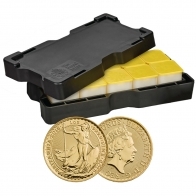 The Britannia gold coin series contain 99.99% investment grade gold bullion. 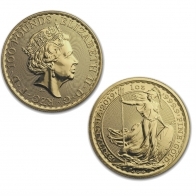 The Britannia series is available in gold and in silver, and are produced by the Royal Mint. 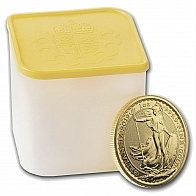 The Royal Mint also produce the gold Sovereign, and the newly released Queen's Beasts series.